Easy dinner recipe! 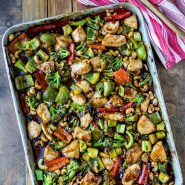 Sheet pan cashew chicken is a tasty 30 minute meal that’s great for weeknight dinners or for make-ahead meal prep. Have you tried sheet pan dinners yet? If not, you should! So, what is a sheet pan dinner? It’s a meal that’s cooked on a sheet pan. I’ve been making a lot of sheet pan suppers lately, and I love how easy they are to make and how easy they are to clean-up. 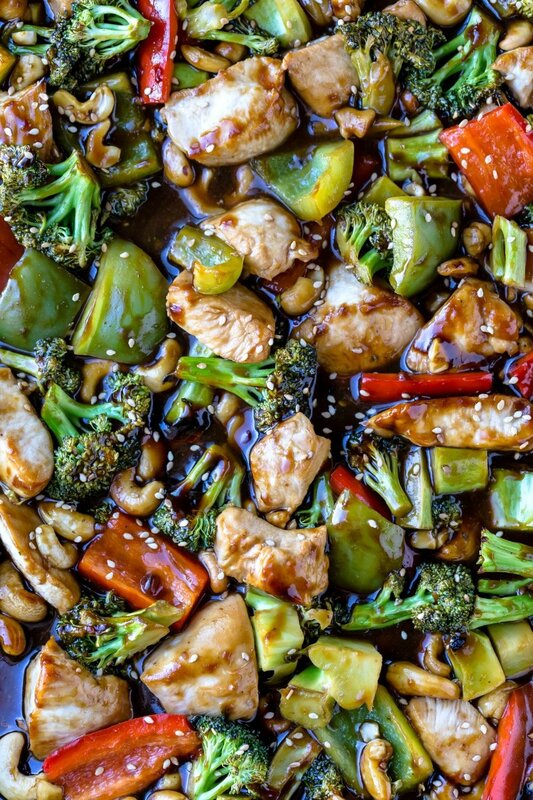 Not only is this sheet pan cashew chicken an easy weeknight dinner, but it’s also good for meal prep. While it’s baking, I make a big batch of quinoa. Then, I just portion this sheet pan cashew chicken out along with the quinoa, and we have lunch for the next few days. See just how simple it is to make this sheet pan dinner! 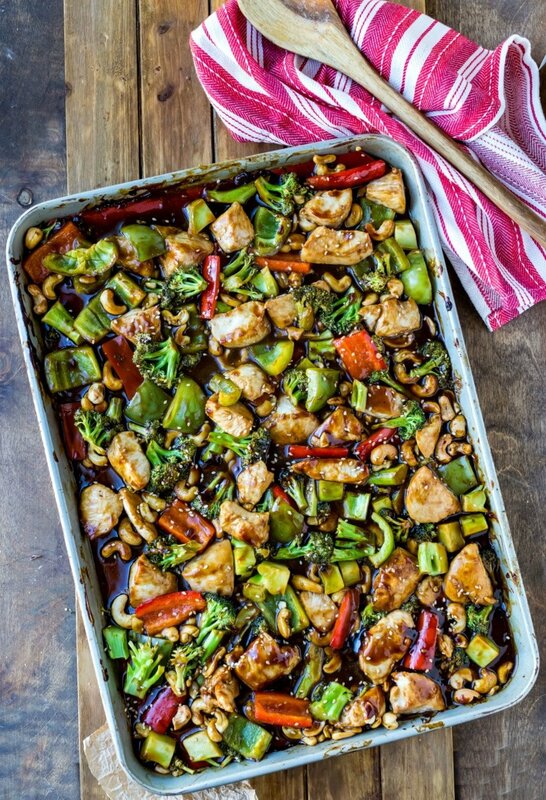 If you’ve tried this sheet pan cashew chicken recipe, don’t forget to rate the recipe and leave me a comment below. I love to hear from people who’ve made my recipes! You can SUBSCRIBE to receive my latest recipe newsletters or FOLLOW ME on FACEBOOK, INSTAGRAM and PINTEREST for even more delicious food. Easy Sheet Pan Cashew Chicken makes a quick weeknight dinner and is great for meal prep! Don't miss the recipe video just above the recipe that shows just how easy this dinner is to make. In a medium saucepan, whisk together sauce ingredients until combined. Bring to a simmer over medium heat, stirring regularly, until sauce thickens. Preheat oven to 400F. Line a large rimmed sheet pan* with parchment paper or a silicone baking mat. Set aside. Place chicken on prepared sheet pan, and drizzle 1/3 sauce over chicken. Toss chicken to coat in sauce. 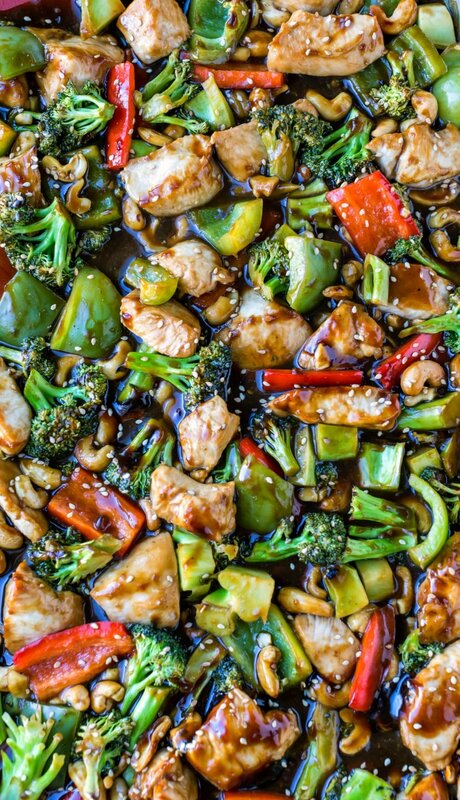 Remove pan from oven, and place broccoli, bell peppers, and cashews in a single layer around the chicken. Pour remaining sauce over chicken and veggies; toss to coat. Return pan to the oven, and continue cooking for an additional 8-12 minutes, or until the chicken is cooked through. Serve by itself or over white rice, brown rice, or quinoa. Sprinkle with extra cashews, if desired. * I use a 12x17-inch baking sheet. 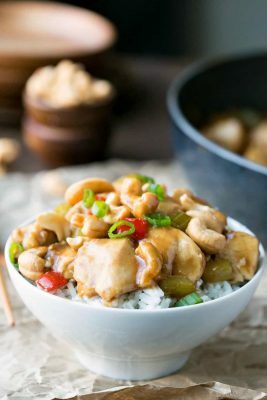 This recipe looks great and I want to try it however I need the sauce to be gluten free and soy free, do you have a suggestion on how to alter it ? I guess I could look up a recipe but I thought I would ask you 1st. Thank you for any help. Thank you! Have you tried aminos (like coconut aminos)? That was my first thought for a gf and soy-free sub for the soy sauce. 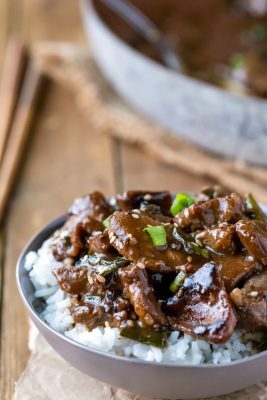 I think the easiest thing to do in place of the hoisin would be to just use a little more of the other ingredients instead (2/3 cup soy sauce sub., 2 tablespoons + 2 teaspoons rice wine vinegar, 1/4 cup packed brown sugar, 1 tablespoon + 1 teaspoon toasted sesame oil, 1 1/2 teaspoons fresh minced ginger, 4 cloves garlic minced). It won’t be exact, and the sauce will be a little thinner, but the flavors should still be there. I hope that helps! Is the serving size supposed to be 1 cup? I haven’t measured out the servings exactly, but it will be more than 1 cup per serving. Thank you so much! That’s some high praise. =) This is one of our favorite meal prep meals, and I love to hear that other people are enjoying it, too. Thanks for commenting! Hi, do you think this would work to prep up to step 9, freeze, and use during the week? It seems like a lot during the week, but to prep and freeze on the weekend would be fabulous. This recipe came out great! I had to substitute apple cider vinegar for rice wine vinegar since I didn’t have rice wine vinegar on hand. I also added water chestnuts. I put it over white rice and my whole family ate it – which rarely happens! I’m so glad you and your family liked it! Water chestnuts are a great addition. =) Thanks for commenting! Yum! This was totally delicious. I left out the sugar and didn’t think it was lacking anything. Next time, I think I’ll cut down on the hoisin a little, add a little more vinegar, and add mushrooms. Total cook time was a little longer than stated – 35 minutes, but I’m at altitude, so that might have contributed. Thank you so much for this recipe; this will be a frequent dish at my house! So glad you liked it! Thank you for the feedback, too! So many people look to cut sugar, so it’s helpful to know that it will still turn out well without the sugar. Thanks again! Delish! I followed the recipe to the letter and my only comment is that it says 30 minutes but it took me over an hour (the prep and cooking time took longer than expected) so I’ll make it on a weekend next time. This recipe is a keeper! Thank you! I appreciate your feedback about the prep and cooking time as I just go off of how long it takes me to prepare. Thanks for taking the time to comment! Thank you so much for this recipe! I just made it and it’s sooooo good! I left out the hoisin sauce because I didn’t have it. But, I added mushrooms and it was very tasty. I served it over brown rice noodles. Thanks again!!! I’m so glad that you liked it and that you were able to adjust it to better suit your tastes! I have one kiddo who isn’t a big fan of peppers but loves carrots, so I’ll have to try it your way next time I make it. =) Thank you for taking the time to come back and comment! Took your suggestion and made this for lunches for the week. It was great! Easy to make and really tasty! Thanks!